This is fabulous escapism. What thirtysomething hasn’t imagined ditching the day job for a life in Hawaii as a beach bum? I loved Palmer’s bravery and the little slice of paradise he finds for himself. The friendship between Palmer and Dill is great and while it took me some time to warm to Riku, he does make for an unusual and attractive love interest. At times, this story reads like a love letter to Hawaii. For me, it was a perfect read for a dark and cold English January. I fell in love with the weather, the waves, and the laid back, lazy lifestyle. And while the surfing scenes in this book are brilliant, Palmer’s identity crisis and Riku’s family responsibilities add some depth and maturity. This is a short story and the plot is a little thin, but the chemistry between Riku and Palmer is hot. The action sequences at the end feel more than a little rushed and I think the story could have benefited from further development of Riku and a full resolution of his family issues. Overall, I enjoyed this story and I look forward to more from this author. Her main support comes from her husband, who reminds her to laugh. Mostly at herself. Their partnership may be difficult to grasp when viewed from the outside, but seen from the inside they are a perfect match. He’s helped her though surgeries and sicknesses and is always willing to wash her hair when she can’t do it on her own. Their children have four legs and fur and will bite them on occasion. One snores loudly. For fun, Foster likes to take pictures of her dachshunds, sew costumes for her dachshunds, snuggle her dachshunds, and bake treats for her dachshunds. In exchange for so much love and devotion, they pee vast amounts on the floor, click their nails loudly on the tile, and bark wildly at anything that moves outside. Somehow, this relationship works for all involved. While not writing, Foster can usually be found playing a video game or watching a movie with her husband. While not doing any of those things, Foster can usually be found in bed, asleep. 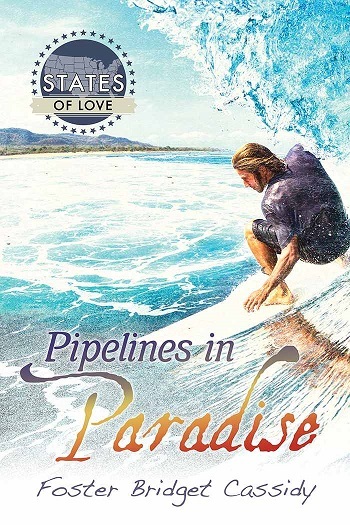 Reviewers on the Wicked Reads Review Team were provided a free copy of Pipelines in Paradise (States of Love) by Foster Bridget Cassidy to read and review.